A cup of coffee and more…. Photographer Roy McKeown bought the derelict Raceview Woollen Mill set in 16 acres in Broughshane – “Garden Village of Ulster”. It was destined for demolition, but rather than demolish it, Roy wanted to create a “village within a village,” featuring a mixture of housing, enterprise units and hospitality. Thus using the site to generate around 100 jobs and draw tourists to the village. This 20ft turbine which once powered the mill has now been sandblasted, cleaned up and painted and been installed at the front of the site as a focal point. Still very much a work in progress, the first phase designed in a similar style to the old mill buildings, provides new workspace for local Art & Craft enterprises. We arrived on a very cold wintery morning to a warm welcome from happy faces beavering away like Santa’s elves at Fiddlesticks Fabrics. 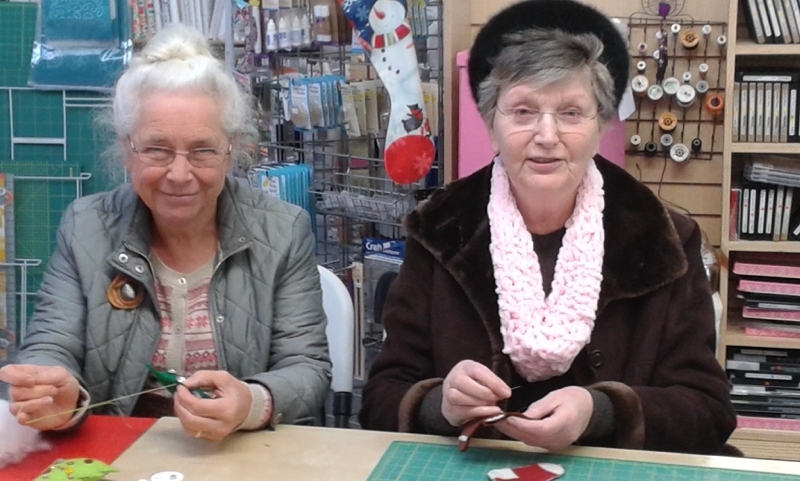 It was all part of Free Make & Take Week from Monday to Sunday 1st-7th December. Santa, together with Mother Christmas reading stories and much more! I didn’t manage to return the next day, but maybe next weekend…. if my Elly wants to be a child once more! 😉 Fiddlesticks Fabrics is my kind of wonderland, below are some of the photos I took, when not chatting or struggling to thread a needle with invisible thread! This age lark is definitely not for wimps. I might be a regular visitor in the year ahead. We eventually adjourned to The Red Brick coffee shop, at Raceview Mill where morning coffee became lunch with wonderful parsnip, celery and apple soup served with wheaten bread, followed by a coffee! Yum, yum, warm tum! I might be a regular visitor in the year ahead to explore the many units that were not ready for business on Friday. Shop fitters were in evidence everywhere, and those open to the public were still in a state of growing into their space. Another attraction will be a riverside path, planted to attract butterflies, connecting with the existing Broughshane buttermilk path. Drum roll please! Spools, safety pins and thimbles. The pack said eighteen pieces. I think I did well. How many can you count? This entry was posted in Crafts and tagged Broughshane, coffee. crafts, exploring, Fun, Raceview Mill on December 8, 2014 by Grannymar. Looks like a neat place. My wife would love it. How wonderful! Love the decor of Fiddlesticks with all those lovely quilts on the wall. 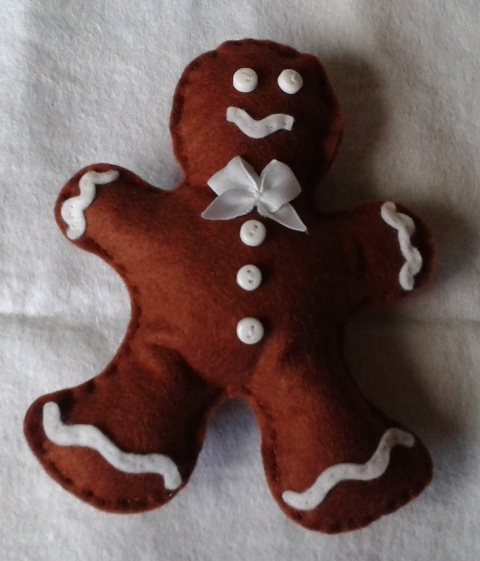 And your Gingerbread man is adorable. Nancy, the wall of quilts topped by a shelf of cushions, provide plenty of inspiration to keep the hands busy. Cheerful and helpful staff made us very welcome and we came away with the feeling we were old friends! Am I receding back to childhood? This year I have made a hedgehog, a pumpkin and now a gingerbread man. Haha! No worries, mate. Your crafty crafts are FUN for all ages. The craft projects are fun to do. I still have a yellow jacket to finish. The short dark days are not good for fine work or old eyes! Can’t wait to visit it myself! Might be handy for us to meet there for coffee, but on a warmer day. The heating is still being sorted. Want the buttons. What a fab place, I’d have to pried out with a crowbar. WWW, I could not leave those buttons behind, they are tiny, but my kinda toys! Yes, Brighid, I wanted to add yarn and laughter to that sign! Seems like a fascinating place to visit. I enjoyed it, but I’m sure when it settles in and all outlets are open, I need a full day! Lots of fun. I would have enjoyed the soup. Gigi, the soup was very tasty. My kinda place. You and Janet look beautiful. Love her hair. Janet is always in good form with her hair up to show aff her wonderful smile!